Whether it’s a bonfire, a campfire, a barbecue or a hearthside, there’s something about a fire. It’s more than the warmth that makes your cheeks glow, more than the light that flickers and dances or the fun and facility for cooking. More than the smell of wood or leaves burning, more than the spitting and sparking sound. All these things are part of it, but they’re not all of it. There’s just something about a fire that makes folks feel good. Makes folks feel happy, relaxed and nostalgic, ready to reminisce, ready to chat. I remember the bonfires we used to build on the beach in the winter when I was a child in the 50s. They were community affairs. Everyone in the little street on the seafront where we lived would turn out to watch the flames as they leapt into the night sky. 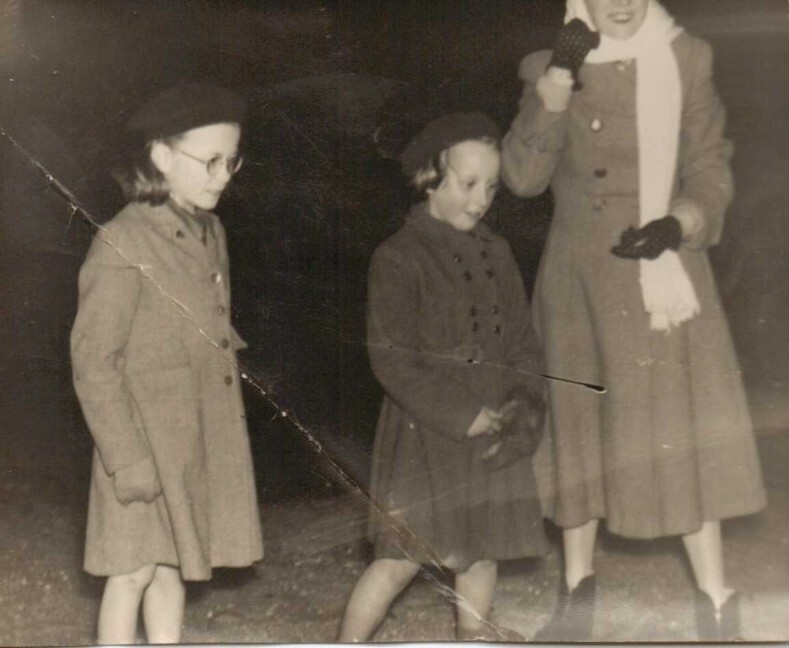 The smell of burning driftwood, the sound of it hissing and sparking, the warmth on your face with the winter chill at your back; if I close my eyes I’m a child again, standing there with my friend, Sheila, our eyes sparkling too, the bonfire reflected in my wee, round, NHS tortoiseshell specs. The adults stood around to supervise and to gossip. The children whooped and played and diced with death in an effort to see who could go in the closest without getting scorched. And the potatoes! The smell of potatoes cooking in the embers as the fire died down a little, precursor to a feast. Patience! Patience! Don’t fish them out with your stick too soon, they’ll be hard in the middle. But watch out! Don’t leave them too long! They’ll be charred right through. But just right, what a feast: milky white flesh roasted to perfection. I dug out this old photograph, taken at just that delicious moment when the fire was low, the potatoes had been in almost long enough and our mouths were watering, anticipating our too-hot-to-handle supper. When handed an actual hot potato, even with gloves on, we’d have to toss it from hand to hand for a while, trying with each toss to squeeze the black, crispy outer jacket a little to break into it till the inner delight would be cool enough to nibble out with our teeth. When our own children were young, we used to take them camping. Brighouse Bay was our favourite place. In those days, the days before the official caravan and camp site that is there now, we were able to pitch our tent right at the edge of the beach. By day, the kids could play in the water, on the beach and in the woods behind it. Come the evening, ‘He Who Shall Not Be Named’, would build a campfire with the twigs and branches he and the children had gathered. 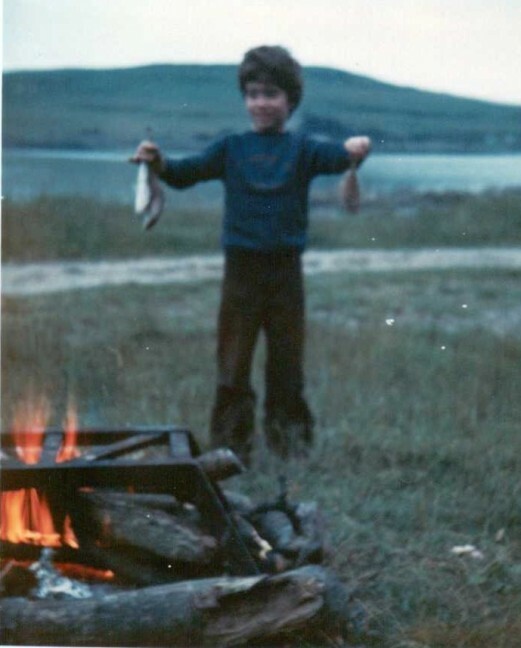 We’d cook any fish they had caught and potatoes wrapped in foil (what sophistication the years had brought!) and we’d sit round the fire and talk. Stories were told, jokes exchanged and secrets shared. We are fortunate to still have a coal fire in our home, not purely by choice–our village has no gas piped into it, so our central heating is powered by the coal fire or a backup electric boiler. I have to admit that the electric central heating is what we use most these days. It saves a lot of work every day cleaning out, laying, lighting and feeding the coal fire. But I do love our coal fire. I love when family or friends come and we sit round the glowing embers, chatting, putting the worlds to rights, laughing, playing games or roasting marshmallows. 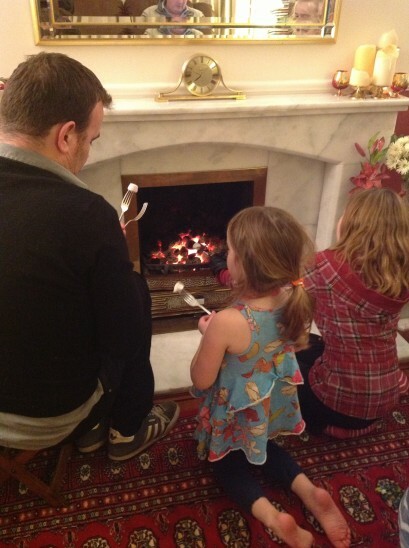 When our children were young and we didn’t have the backup of the electric boiler, we always had the coal fire going, so all our kids love it. it was particularly great to come home to after sledging and playing in the snow. 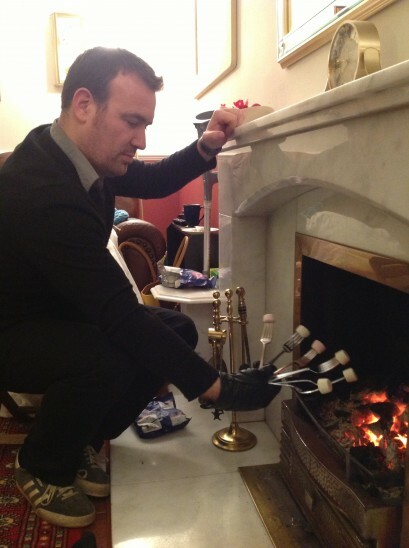 While they were out, I’d build the fire really high so that it was blazing when they came in, then I’d make mugs of hot chocolate and they’d huddle round what Kenny used to call ‘the snowy fire’. Sometimes I like to imagine some of the people I admire from days gone by sitting round my fire chatting. People like Jane Austen, The Bronte sisters, George Eliot. I could ask them what it was like to be a woman author in what was very much ‘a man’s world’. What it was like to write by candle light, with pen and ink on thick vellum paper. Where did they find the patience and passion to write their novels so painstakingly by hand, neatly enough for an editor to read and appraise, not just the scribbled rushing flow of tumbling thoughts? What was their inspiration? What keen observers they were of the failings and foibles of those around them: the pride and the prejudice. (Goodness! What a great idea for the title of a novel!) What grand passions had they felt or imagined? So, it’s with these things in mind, I thought it would be nice to post some ‘Fireside Chat’ pages. Now, it’s not always possible for the folks I’d like to chat with to be here with me, but we can sit round a virtual fire, a cyber fireside. It’ll take a little imagination, but isn’t that what writing and reading are often about? So, cosy up, folks. Draw your chair in closer and join me by the fire. Perhaps you’d like to tell me who you would choose to join us if they could, and why they’d make interesting hearthside companions? Let me add who I would choose: Homer, Dante, and Shakespeare. These three writers are the cornerstones for so much of literature. Good choices. What questions would you like to ask them?